I am currently writing up a new paper, bringing together everything I know in an improved formate. I have had many discussions with professional scientists, from which I am still positive of my hypothesis. While I have had the support of two professors, others have shown absolute dislike to my discoveries. I was in review with a retired professor of chemistry, a climate skeptic, for 1 month, 40 odd email exchanges, and he gave me every logical fallacies in the book, red herrings, and in the end suggested I made it all up. I have not made this up. I have posted on a page a transcript of a dialog I had with some scientists on facebook. I want to post this to show the fallacies. If I am wrong. Tell me where I am wrong, and if I see I am wrong I will change my claim. Climate science's fundamental premise – assumed by all parties in the great climate debate – says the greenhouse gases – constituting less than 2% of Earth’s atmosphere; first derived by John Tyndall‘s in his 1859 thermopile experiment, and demonstrated graphically today by infrared IR spectroscopy – are special because of their IR (heat) absorbing property. From this, it is – paradoxically – assumed the (remaining 98%) non-greenhouse gases N2 nitrogen and O2 oxygen are non-heat absorbent. This paper reveals, by elementary physics, the (deceptive) role thermopiles play in this paradox. It was found: for a special group substances – all sharing (at least one) electric dipole moment – i.e. CO2, and the other greenhouse gases – thermopiles – via the thermoelectric (Seebeck) effect – generate electricity from the radiated IR. Devices using the thermopile as a detector (e.g. IR spectrographs) discriminate, and have misinterpreted IR absorption for anomalies of electricity production – between the sample gases and a control heat source. N2 and O2 were found to have (as all substances) predicted vibrational modes (derived by the Schrodinger quantum equation) at 1556cm-1 and 2330cm-1 respectively – well within the IR range of the EM spectrum and are clearly observed – as expected – with Raman Spectroscopy – IR spectroscopy’s complement instrument. 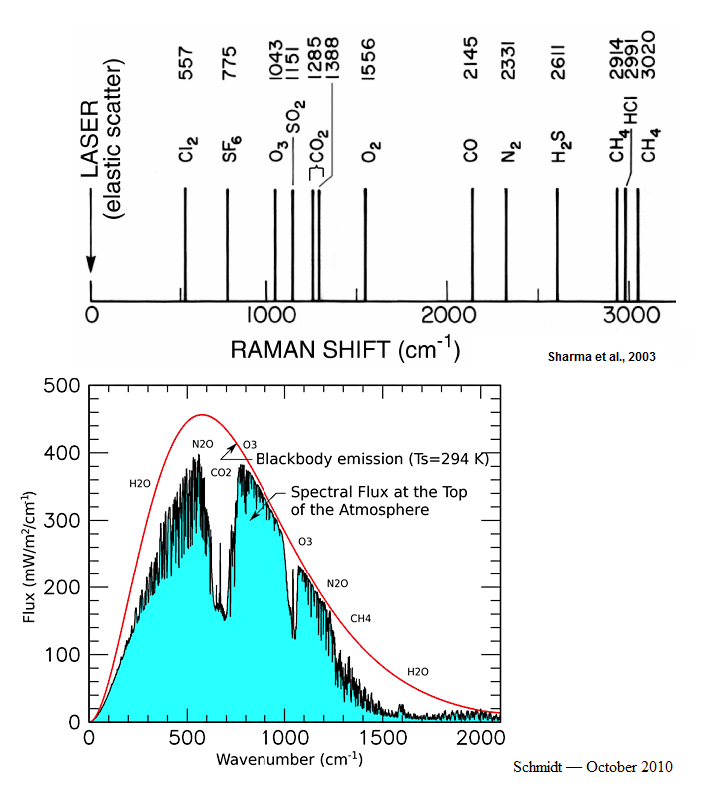 The non-greenhouse gases N2 and O2 are relegated to greenhouse gases, and Earth’s atmospheric thermoelectric spectrum was produced (formally IR spectrum), and was augmented with the Raman observations. It was concluded the said greenhouses gases are not special, but typical; and all substances have thermal absorption properties, as measured by their respective heat capacities. Figure 10. The Augmented Greenhouse Atmosphere. Combining Thermoelectric spectra with Raman spectral to reveal the complement of atmospheric vibrational modes, and the greenhouse atmosphere of planet Earth. That is a very interesting video. I have yet to read your paper. It is a pity that you say you have no interest in the climate debate. The debate needs input such as yours that brings clarity to the arguments. I am a mechanical engineer so the physics you discussed was not covered in my degree. However, I believe you are right. Tyndall was measuring the thermoelectric properties of gases but the climate is not about that. It is about the thermodynamic properties. This confusion is at the centre of the debate and it has resulted in the biggest scientific fraud ever inflicted on the human race. The thermodynamics in the climate debate make no sense at all. It starts with the concept of the earth being in equilibrium over a year and so averages are used. It is said that the energy arriving and leaving is the same over a year. But the calculations do not use energy they use energy density and this cannot be averaged and equated. The energy arrives on one half of the earth but it leaves over all the surface. The density arriving and leaving cannot be equated which is seen in all the energy balance diagrams. Because the assumption is that the energy leaves from the same area that is receiving energy it has to be increased but the surface temperature cannot radiate this amount of energy and hence the concept of the additional heating from the greenhouse gases was created. This resulted in the concept of backradiation, meaning that radiation that leaves the surface is "trapped" and then returns to the surface to cause additional heating. This defies all known laws of heat transfer. Radiation from a body cannot return to that body and cause additional heating. Heat cannot be transferred from the colder atmosphere to the warmer surface. The concept it utter nonsense. The sun itself cannot heat the surface to the average temperatures we experience. The higher temperature is not due to a greenhouse effect. It is due to the effect of energy conservation in a column of gas in a gravity field. It is just the same as compressing air in a bicycle pump. Compressed air increases in temperature. It continues to increase in deep mines which is why the cannot be cooled by pumping cooler air from the surface. Gravity increases the temperature. Venus is used as an example to show the effect of CO2 but on Venus it is still gravity. The atmosphere is so dense that much of the sun's radiation is absorbed and reflected and it does not reach the surface. It is the greater density of the surface gases that cause he higher temperature on Venus. When the theoretical temperature of the earth's surface without an atmosphere is calculated it would be higher than it is with an atmosphere. The atmosphere does exactly the opposite of the claim - it cools and does not warm the surface. You refer to Tyndall's experiment but a simple version was demonstrated by Iain Stewart using a candle. This experiment was rigged just like a magic trick to make the candle disappear. Look up the comments by Dr Jonathan Hare of The Creative Climate Centre and he describes how it was done. More recently Prof Andrea Sella claimed to show the effect with a demonstration on a BBC Series about weather called "Storm Troupers" he used a light and a piece of gun cotton held in the beam. The gun cotton burst into flames, but only because a magnifying glass was used to concentrate the energy. A tube of carbon dioxide was then placed in the beam and the gun cotton did not light. The claim being that CO2 caused extra warming. It of course showed the opposite in the experiment since there was no surface to reflect IR. All it showed was that CO2 in the atmosphere scatters radiation. Keep up the good work and do relate it is climate change and get this fraud into open debate.